The use of cysteinyl leukotriene receptor antagonists (LTRAs) for asthma therapy has been associated with a significant degree of interpatient variability in response to treatment. Some of that variability may be attributable to noncysteinyl leukotriene type 1 receptor (CysLT1)-mediated inhibitory mechanisms that have been demonstrated for this group of drugs. We used a model of CysLT1 signaling in human monocytes to characterize CysLT1-dependent and -independent anti-inflammatory activity of two chemically different, clinically relevant LTRAs (montelukast and zafirlukast). Using receptor-desensitization experiments in monocytes and CysLT1-transfected HEK293 cells and IL-10– and CysLT1 small interfering RNA-induced downregulation of CysLT1 expression, we showed that reported CysLT1 agonists leukotriene D4 and UDP signal through calcium mobilization, acting on separate receptors, and that both pathways were inhibited by montelukast and zafirlukast. However, 3-log greater concentrations of LTRAs were required for the inhibition of UDP-induced signaling. 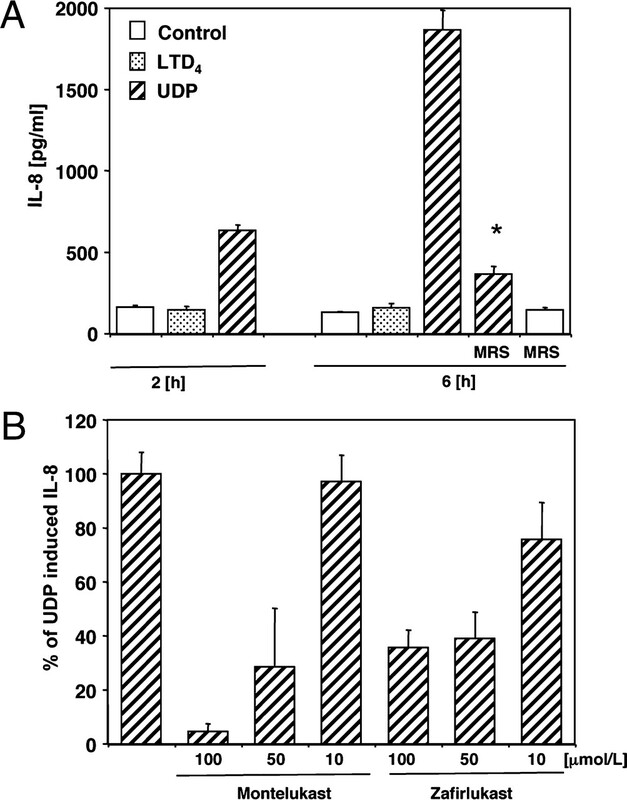 In monocytes, UDP, but not leukotriene D4, induced IL-8 production that was significantly inhibited by both drugs at micromolar concentrations. At low micromolar concentrations, both LTRAs also inhibited calcium ionophore-induced leukotriene (leukotriene B4 and leukotriene C4) production, indicating 5-lipoxygenase inhibitory activities. We report herein that montelukast and zafirlukast, acting in a concentration-dependent manner, can inhibit non–CysLT1-mediated proinflammatory reactions, suggesting activities potentially relevant for interpatient variability in response to treatment. Higher doses of currently known LTRAs or new compounds derived from this class of drugs may represent a new strategy for finding more efficient therapy for bronchial asthma. Leukotrienes have been implicated in the pathophysiology of bronchial asthma. Drugs inhibiting leukotriene signaling, such as cycteinyl leukotriene receptor antagonists (LTRAs) (montelukast, pranlukast, and zafirlukast), were shown to be effective in treating this disease (1, 2). However, their use has been associated with a significant degree of interpatient variability in response to treatment. In clinical trials, 20–50% of patients receiving LTRAs could be classified as responders, showing a great heterogeneity in response to these drugs, which affects the effectiveness of treatment (3, 4). Much of that variability may be attributable to genetic variations; several studies reported that genetic polymorphisms in genes encoding key proteins in the leukotriene pathway might influence the response to LTRAs (5, 6). Another cause of variability may be associated with the pharmacokinetic characteristics of the drugs used and the final individual compound plasma concentrations obtained during treatment. All LTRAs act on the cysteinyl leukotriene type 1 receptor (CysLT1) and by competitive antagonism at this receptor are believed to be responsible for the control of airway inflammation, bronchoconstriction, and remodeling (7, 8). However, anti-inflammatory activity of LTRAs independent of CysLT1 antagonism was recently suggested. Montelukast reduced the expression of urokinase plasminogen activator receptor and the secretion of metalloproteinase-9 in human eosinophils in vitro (9), and it inhibited TNF-α–mediated IL-8 expression in U937 cells through mechanisms distinct from CysLT1 antagonism (10). Interestingly, it was shown that montelukast may have a novel inhibitory effect on 5-lipoxygenase (5-LO) activity (11) and transport of leukotrienes by the multidrug resistance protein ABCC4 (12), suggesting a broader mechanism of action for this drug. Non–CysLT1-related mechanisms of LTRA actions might present another level of variability in the response to treatment in patients with asthma. Some of these non–CysLT1-related activities of LTRAs may be compound specific or may depend on drug concentration or the presence of a particular inflammatory pathway in patients with asthma; therefore clinically significant effects of treatment may be observed in some, but not all, treated subjects. We previously showed that CysLT1 is the predominantly expressed leukotriene receptor in human elutriated monocytes and that leukotriene D4 (LTD4), acting through CysLT1, can induce the activation and chemotaxis of these cells (13). In the current study, we used this model of CysLT1 signaling in human monocytes to characterize the CysLT1-dependent and -independent inhibitory activity of two chemically different, clinically relevant LTRAs (montelukast and zafirlukast) and to define the pathways of their inhibitory action. LTD4, montelukast, and zafirlukast (Cayman Chemical, Ann Arbor, MI), calcium ionophore A23187 (EMD Chemicals, Gibbstown, NJ), UDP, P2Y6 inhibitor (MRS2578), DMSO (all from Sigma-Aldrich, St. Louis, MO), and human rIL-10 (R&D Systems, Minneapolis, MN) were obtained from the manufacturers. Human elutriated monocytes from healthy donors were obtained by an institutional review board-approved protocol from the National Institutes of Health Blood Bank (Bethesda, MD), resuspended in RPMI 1640 medium supplemented with 10% heat-inactivated FBS and 2 mmol/l l-glutamine (all from Invitrogen, Carlsbad, CA), and allowed to rest overnight before experiments at 37°C in a humidified 5% CO2 incubator. Human embryonic kidney (HEK293) cells (American Type Culture Collection, Manassas, VA) were cultured in DMEM medium (Invitrogen) supplemented with 10% FBS. Calcium mobilization experiments were conducted using a FLIPR Calcium 3 assay kit (Molecular Devices, Sunnyvale, CA), according to the manufacturer’s instructions. Cells (2 × 105 cells/well) were plated into poly-l-lysine–coated 96-well plates and incubated in RPMI 1640 supplemented with 10 mmol/l HEPES and FLIPR 3 assay reagent. After incubation for 1 h at 37°C, fluorescence was measured every 4 s using the FlexStation (Molecular Devices). HEK293 cells were grown in 75-ml flasks and transiently transfected with empty pcDNA 3.1 vector or CysLT1 expression vector (Missouri University of Science and Technology cDNA Resource Center, Rolla, MO) using Lipofectamine 2000 (Invitrogen) in serum-free medium (Opti-MEM I, Invitrogen), transferred to poly-l-lysine–coated 96-well plates after 24 h, and used for calcium mobilization experiments after an additional 24 h of incubation. Silencer Select predesigned small interfering RNA (siRNA) (CysLT1: 5′-G-GAAAAGGCUGUCUACAUUtt-3′; cysteinyl leukotriene type 2 receptor [CysLT2]: 5′-GCACAAUUGAAAACUUCAAtt-3′; P2Y6: 5′-GAAGCUC-ACCAAAAACUAUtt-3′) and Silencer Select Negative Control siRNA (Ambion, Austin, TX) were used for CysLT1, CysLT2, and P2Y6 knockdown experiments. Elutriated monocytes (5 × 106) were nucleofected with 4 μg negative control or specific siRNA using a Human Monocyte Nucleofector kit (Amaxa, Cologne, Germany), according to the manufacturer’s protocol. After 24 h, media were replaced, and cells were used for functional studies. Total RNA was extracted from cells using QIA Shredder columns and RNeasy mini kit and was treated with DNase (Qiagen, Valencia, CA). mRNA expression for selected genes was measured using real-time PCR performed on an ABI Prism 7900 sequence detection system (Applied Biosystems, Foster City, CA) using the following commercially available probe and primers sets (Applied Biosystems): CysLT1, Hs00272624_s1; CysLT2, Hs00252658_s1; and P2Y6, Hs00602548_m1. Reverse transcription and PCR were performed using an RT kit and TaqMan Universal PCR master mix (Applied Biosystems), according to the manufacturer’s directions. Relative gene expression was normalized to GAPDH transcripts and calculated as a fold-change compared with control. For IL-8 determination, monocytes (2 × 106) were stimulated with LTD4 (100 nmol/l) or UDP (100 μmol/l) for 2 and 6 h in the presence or absence of inhibitors. Supernatants were stored at −20°C until analysis by commercial Quantikine ELISA (R&D Systems) for IL-8. Monocytes (1 × 106) were resuspended in culture medium without FBS; preincubated with different concentrations of montelukast, zafirlukast, or vehicle control (DMSO); and stimulated with calcium ionophore A23187 (1 μmol/l) or DMSO for 30 min. Supernatants were collected by centrifugation and frozen at −80°C for leukotriene measurement. For intracellular leukotriene determination, elutriated monocytes (2 × 106) were used, reactions were stopped by the addition of cold PBS, and cells were collected by centrifugation at 4°C. Cells were lysed by freezing (three times), followed by lipid purification using an solid phase extraction (C-18) cartridge (Cayman Chemical), according to the manufacturer’s protocol. Purified samples were resuspended in enzyme immunoassay buffer and assayed directly. The concentration of leukotriene B4 (LTB4), leukotriene C4 (LTC4), and PGE2 produced spontaneously and after stimulation was assayed by means of competitive enzyme immunosorbent assay (Cayman Chemical), according to the manufacturer’s protocol. Data were analyzed by one-way ANOVA or paired and unpaired Student t tests, as appropriate. Differences were considered significant when p < 0.05. It was suggested that CysLT1 has a dual cysteinyl leukotriene (cysLT)/UDP specificity (14). To investigate a role for LTRAs in CysLT1-mediated reactions, the responsiveness of human monocytes to LTD4 and UDP was evaluated by intracellular calcium flux measurement. As shown in Fig. 1, monocytes responded in a concentration-dependent manner to LTD4 and UDP. However, the concentration of UDP that was most effective at inducing calcium flux was 3-log greater (10−4 mol/l) than the most effective concentration of LTD4 (10−7–10−6 mol/l). CysLT1 antagonists (montelukast and zafirlukast) were used to analyze whether LTRAs similarly inhibit UDP and LTD4 signaling in monocytes. Both antagonists inhibited (Fig. 2) LTD4- and UDP-induced calcium flux in monocytes in a concentration-dependent manner. However, as only low nanomolar concentrations of montelukast and zafirlukast were required to fully inhibit LTD4-induced calcium flux, much higher (10−5–10−4 mol/l) concentrations of antagonists were required to inhibit UDP-induced calcium changes. LTD4 and UDP induce calcium mobilization in monocytes. Monocytes were prepared and stimulated with different concentrations of LTD4 or UDP, and calcium release was measured, as indicated in Materials and Methods. Data are presented as means ± SD from three separate experiments, each performed in triplicate. Montelukast and zafirlukast inhibit UDP- and LTD4-induced calcium mobilization in monocytes. Monocytes were stimulated with 100 μmol/l UDP (A, C) or 100 nmol/l LTD4 (B, D) in the presence of increasing concentrations of montelukast (A, B), zafirlukast (C, D), or vehicle control (10 min pretreatment). Results are shown as the percentage of peak fluorescence obtained in cells stimulated without inhibitors. The means ± SD from three independent experiments are presented. To further characterize the responsiveness of human monocytes to LTD4 and UDP, the submaximally effective concentrations of LTD4 (10−7 mol/l) and UDP (10−4 mol/l) were used to analyze the pattern of calcium signaling and desensitization. In monocytes, LTD4 induced a rapid increase in intracellular calcium levels that relatively quickly decreased to baseline levels (Fig. 3A). UDP also rapidly increased intracellular calcium levels; however, these were sustained for only 10–20 s and then decreased to baseline. The different patterns of calcium changes induced by UDP compared with LTD4 suggested that those compounds could activate different receptors or signaling pathways. In agreement with the above observation, stimulation with LTD4 (10−7 mol/l) potently desensitized monocytes to subsequent stimulation with the same concentration of LTD4 (10−7) (as expected for homologous desensitization), but it did not have any effect on subsequent UDP exposure, suggesting again that UDP could act through a separate receptor (not CysLT1). When cells were stimulated with UDP, full desensitization of calcium signaling was observed for the subsequent UDP exposure (homologous desensitization) and partial inhibition of signaling to subsequent LTD4 stimulation. To determine whether LTD4 and UDP could activate CysLT1, HEK293 cells were transiently transfected with the human CysLT1 construct. HEK293 cells did not express CysLT1 mRNA and, when transfected with empty pcDNA 3.1 vector, did not show calcium responses after LTD4 stimulation up to 10−6 mol/l concentration (data not shown). In cells transfected with CysLT1 (Fig. 3B), LTD4 induced calcium flux with a pattern similar to that observed in monocytes, and full homologous desensitization to LTD4 was present. However, empty vector and CysLT1-transfected HEK293 cells responded to UDP with potent calcium flux; the most effective concentration was 10−4 mol/l. When the desensitization experiments were carried out, a similar level of homologous desensitization to UDP was observed in empty control and CysLT1-transfected cells. Interestingly, the same pattern of heterologous desensitization as in monocytes was identified in CysLT1-transfected cells: partial desensitization by UDP to subsequent LTD4 stimulation and no desensitization by LTD4 to subsequent UDP exposure. All of these data suggested that UDP induced calcium flux through a separate receptor, not CysLT1. It was shown that UDP can induce calcium flux in several cell systems acting through nucleotide G-protein coupled receptors (GPCRs), with P2Y6 being the most selective for UDP. We confirmed the presence of P2Y6 mRNA in monocytes, but the level of expression of P2Y6 mRNA in HEK293 cells was very low (data not shown), suggesting that UDP could activate calcium flux through this or other nucleotide receptors in these cells. UDP (100 μM) induced a calcium flux in untransfected HEK cells that was not inhibited by the P2Y6 inhibitor MRS2578 (5 μM). 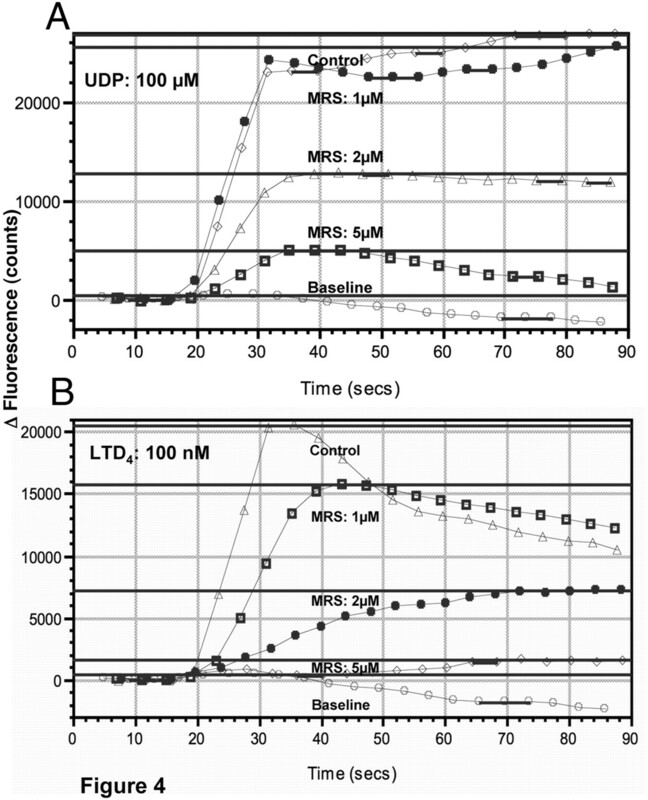 When used at micromolar concentrations, MRS2578 inhibited UDP- and LTD4-induced calcium flux in monocytes in a concentration-dependent manner (Fig. 4). We previously reported that IL-10 downregulates CysLT1 expression and signaling in human monocytes (15). Monocytes were exposed to IL-10 (20 ng/ml) overnight to downregulate CysLT1, and calcium flux to LTD4 and UDP was evaluated. IL-10 downregulated CysLT1 mRNA (measured by real-time PCR) and inhibited LTD4-induced calcium flux, whereas UDP signaling was not significantly affected (Fig. 5A), suggesting that UDP does not signal through CysLT1 in monocytes. To further confirm this observation, CysLT1 expression was specifically downregulated by siRNA, as previously described (15), and calcium flux was measured in response to different concentrations of LTD4 and UDP. As expected, in CysLT1 siRNA-treated cells, LTD4-induced calcium flux was significantly inhibited, in contrast to UDP-induced signaling, which remained similar in CysLT1 siRNA-treated cells and control cells (Fig. 5B). Treatment of cells with siRNA directed at CysLT2 reduced CysLT2 mRNA by 87%, but it did not reduce LTD4- or UDP-induced calcium flux (data not shown). 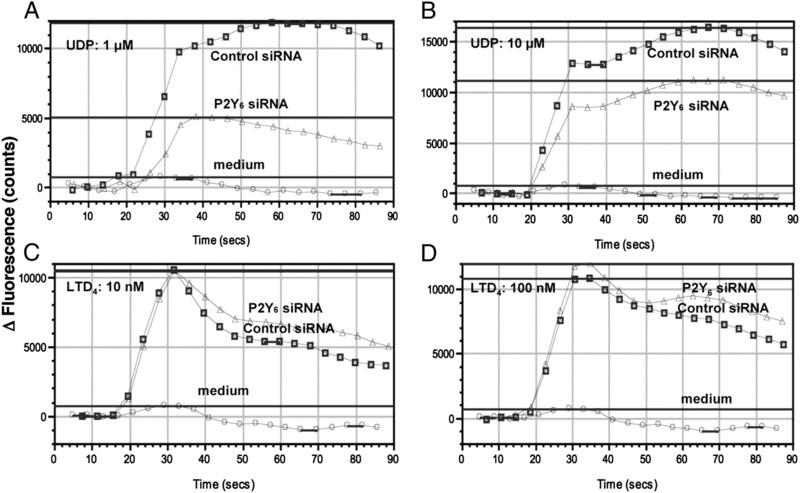 To analyze whether UDP signals through P2Y6 in monocytes, P2Y6 was knocked down using siRNA, and the response to LTD4 and UDP was measured. P2Y6 mRNA was knocked down by 85% (four measurements). UDP-induced calcium flux was inhibited in P2Y6 siRNA-treated cells, whereas LTD4-induced signaling was not affected (Fig. 6), showing that P2Y6 may be one of the target receptors for UDP-induced signaling in monocytes. Desensitization effects in LTD4- and UDP-stimulated monocytes and CysLT1-transfected HEK293 cells. 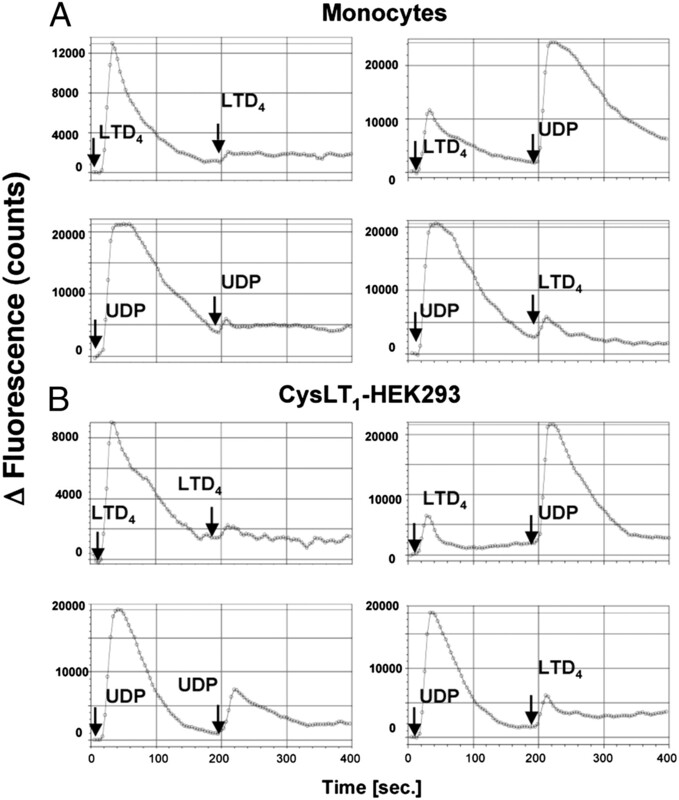 Representative traces of calcium flux induced by repeated exposure to LTD4 (100 nmol/l) and UDP (100 μmol/l) in monocytes (A) and CysLT1-transfected HEK293 cells (B). Data from one of three separate experiments, each with similar results, are shown. The effect of P2Y6 inhibitor MRS2578 on UDP- and LTD4-induced calcium flux in monocytes. 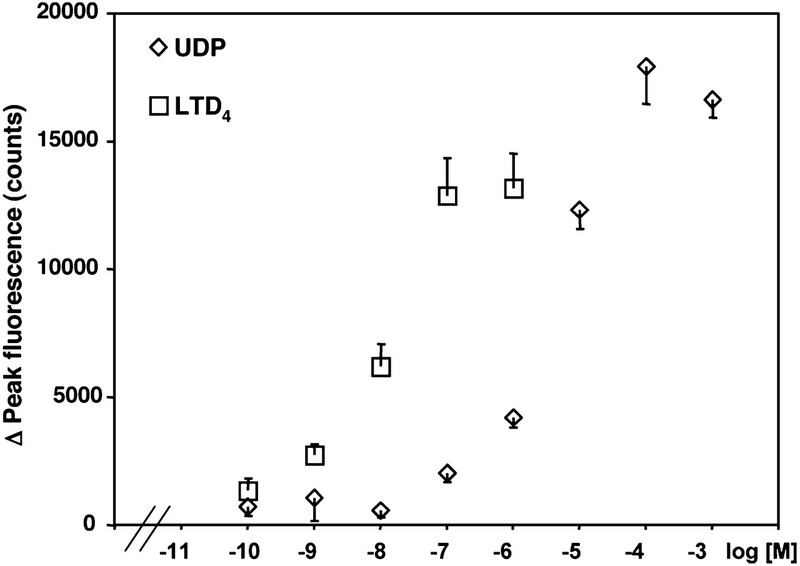 Representative traces of calcium flux induced by exposure to UDP (100 μmol/l) or LTD4 (100 nmol/L) in the presence of increasing concentrations of MRS2578 (MRS) or vehicle control. Data from one of three separate experiments, each with similar results, are shown. Downregulation of CysLT1 did not affect UDP-induced calcium mobilization in monocytes. A, Monocytes were incubated with or without IL-10 (20 ng/ml) overnight, and calcium release was measured in response to different concentrations of LTD4 and UDP, as described in Materials and Methods. 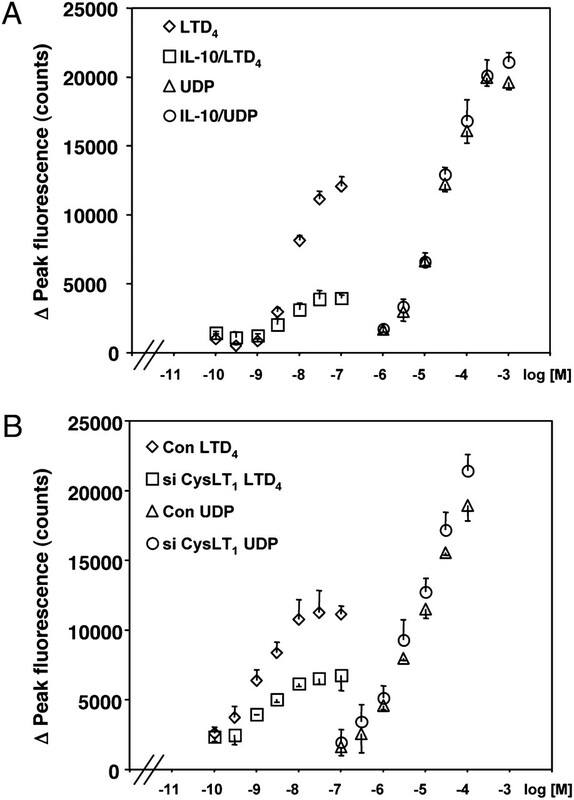 B, Monocytes were nucleofected with CysLT1 siRNA or negative control oligonucleotides (Con), as described in Materials and Methods, cultured for 24 h, and calcium flux was measured in response to LTD4 or UDP. Data are means ± SD from three separate experiments, each performed in triplicate. Knockdown of P2Y6 did not affect LTD4-induced signaling in monocytes. Monocytes were nucleofected with P2Y6 siRNA or negative control oligonucleotides (control), as described in Materials and Methods, cultured for 24 h, and calcium flux was measured in response to different concentrations of UDP (A, B) or LTD4 (C, D). Representative traces of calcium flux from one of three separate experiments, each with similar results, are shown. All of these data suggest that in human monocytes, LTD4 and UDP activate separate receptors, LTD4 induces calcium flux through CysLT1 and UDP signals at least in part through P2Y6. It was reported that UDP mediates IL-8 production in monocytic THP-1 cells (16). To determine whether LTRAs may inhibit other UDP-induced functions, in addition to intracellular calcium flux, monocytes were stimulated with LTD4 or UDP, and the synthesis of IL-8 was measured as described in Materials and Methods. UDP, but not LTD4, induced IL-8 production in a time-dependent manner (Fig. 7A) that was significantly inhibited by the P2Y6 inhibitor MRS2578 (10 μmol/l). Montelukast and zafirlukast also inhibited IL-8 production in a concentration-dependent manner (Fig. 7B). These data further confirm that LTD4 and UDP signal differently in human monocytes and that LTRAs may significantly affect the UDP-induced activation of these cells. It was recently reported that CysLT1 knockdown inhibited LTD4- and UDP-induced chemokine generation in human mast cells (17). In contrast, we did not observe significant changes in chemokine (IL-8) generation in CysLT1 siRNA-treated monocytes compared with control siRNA-treated cells (data not shown). This suggests that UDP and cysLTs may signal differently in different types of cells (mast cells and monocytes), probably reflecting differences in GPCR expression. Montelukast and zafirlukast inhibit UDP-induced IL-8 production in monocytes. A, Monocytes were preincubated with MRS2578 or vehicle control for 30 min and stimulated with LTD4 (100 nmol/l) or UDP (100 μmol/l). Supernatants were collected after 2 and 6 h, and IL-8 expression was measured. B, Monocytes were preincubated with different concentrations of LTRAs, stimulated with UDP, and IL-8 expression was measured after 6 h. Data are presented as the percentage of UDP-induced IL-8 production from cells pretreated with vehicle control. Means ± SD from three separate experiments are presented. *p < 0.001, Student t test. To establish whether LTRAs may affect 5-LO activity and leukotriene production, monocytes were stimulated with calcium ionophore A23187, and synthesis of LTB4 and LTC4 was measured. Stimulated monocytes produced significant levels of both leukotrienes, which were inhibited by pretreatment with montelukast (Fig. 8A) and zafirlukast (Fig. 8B) in a concentration-dependent fashion. Both antagonists (5 μmol/l) fully inhibited leukotriene production, suggesting that 5-LO could be directly affected by the treatment. To exclude the possibility that LTRAs affect arachidonic acid synthesis by phospholipase A2, PGE2, as a product of the cyclooxygenase pathway of arachidonic acid cascade, was measured in the same experiments. Neither montelukast nor zafirlukast (5 mol/l) inhibited calcium ionophore-induced PGE2 generation (Fig. 8D). To further analyze whether LTRAs inhibit the production of leukotrienes and not transport out of the cell, monocytes were stimulated with calcium ionophore, and intracellular levels of LTB4 and LTC4 were measured as described in Materials and Methods. Calcium ionophore stimulation produced detectable intracellular levels of both leukotrienes (Fig. 8C), which were inhibited by pretreatment with montelukast and zafirlukast, indicating that LTRAs may significantly downregulate the production of leukotrienes in human monocytes. Montelukast and zafirlukast inhibit leukotriene synthesis in monocytes. 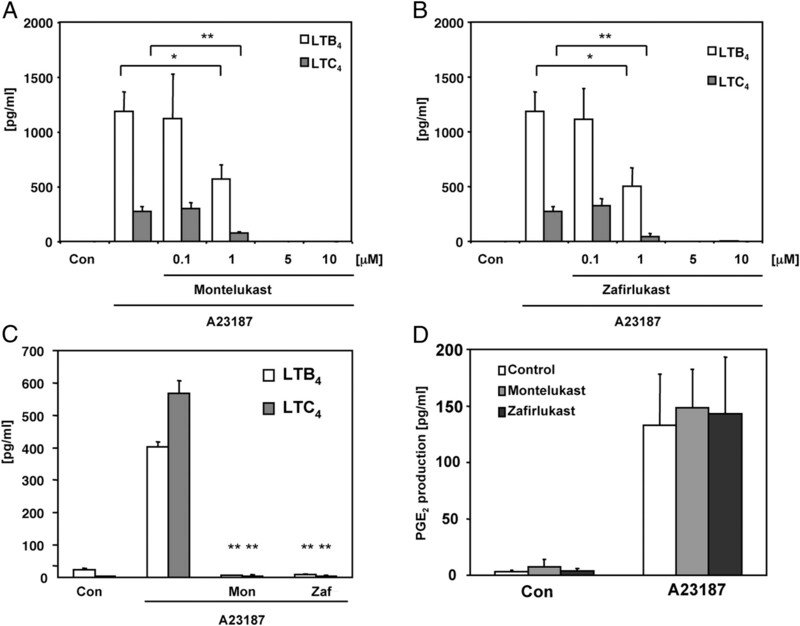 Monocytes were preincubated for 10 min with different concentrations of montelukast (A) and zafirlukast (B) or vehicle control, stimulated with calcium ionophore A23187 (1 μmol/l), and levels of LTB4, LTC4, and PGE2 (D) released were measured. C, Cells were preincubated with 5 μmol/l montelukast (Mon) or zafirlukast (Zaf), and intracellular levels of LTB4 and LTC4 were measured as described in Materials and Methods. The means ± SD from three donors, performed in triplicate, are shown. *p < 0.01; **p < 0.001 for A23187-stimulated cells with versus without inhibitor. We presented evidence herein that so-called “selective CysLT1 antagonists” montelukast and zafirlukast possess concentration-dependent non–CysLT1-mediated inhibitory activities in primary human monocytes. Both drugs effectively inhibited LTD4-induced signaling at the nanomolar concentration range, in agreement with CysLT1 antagonist activity reported in previous studies (18, 19). Interestingly, montelukast and zafirlukast, acting at low micromolar concentrations, also inhibited LTC4 and LTB4 synthesis, probably through a direct inhibition of 5-LO. It was suggested that montelukast may directly inhibit 5-LO activity, binding to an undefined allosteric site on 5-LO (11). In our study, montelukast and zafirlukast similarly inhibited leukotriene synthesis, but not PGE2 generation, suggesting that this 5-LO inhibitory activity is not specific for montelukast; it can be applied to other LTRAs as well. The next proinflammatory pathway, inhibited in our study by both compounds at higher micromolar concentrations, is UDP-induced signaling and IL-8 production. Extracellular nucleotides, such as UTP and UDP, were shown to activate phospholipase C and intracellular calcium mobilization in differentiated U937 cells through purine P2Y receptors; those effects were inhibited by micromolar concentrations of montelukast and pranlukast (20). We validated these observations in a human primary cell system, and we showed that such an inhibition of signaling may have functional consequences for cell activation, measured at the level of UDP-induced IL-8 production. We report herein that two chemically different LTRAs might possess, in addition to CysLT1 antagonism, anti-inflammatory activities in primary human cells. The fact that these additional inhibitory activities are strongly related to the drug concentration might have potential clinical relevance. LTRAs, in contrast to many other drugs, are believed to require membrane transporters for their absorption after oral administration (21–23). In addition, other features, such as strong binding to plasma albumin (>99%) and extensive hepatic metabolism, suggest that the bioavailability of those drugs might be affected by pharmacogenetic and pharmacokinetic factors, resulting in variability of plasma drug concentration and response to treatment. Although there are no published population-based data demonstrating pharmacogenetic influence on LTRA plasma concentrations, case reports showed significant variations in montelukast plasma levels in healthy subjects (24). In addition, it was recently shown that genetic variation of OATP2B1, a membrane transport protein, was associated with variable montelukast plasma concentrations and variable response to treatment in patients with asthma (25). The maximum plasma concentration after orally administered montelukast, 10 mg, ranged from 0.57 to 0.63 μmol/l in healthy female and male subjects, respectively (26); it reached 0.80 μmol/l following administration of a 10-mg chewable tablet in adults and a 5-mg chewable tablet in 9- to 14-y-old children (27). These concentrations are very close to the concentrations of montelukast and zafirlukast required for leukotriene synthesis inhibition (1–5 μmol/l) in our study. Bearing in mind potential genetically driven variability in drug absorption and metabolism, it is plausible to consider that even after the administration of a standard dose of LTRAs in some patients, inhibition of the leukotriene synthesis pathway might be observed in addition to CysLT1 antagonism. The clinical relevance of additional inhibitory activity of LTRAs on 5-LO has not been addressed. In a placebo-controlled, dose-ranging study of montelukast in patients with asthma, doses from 10–200 mg/d were analyzed; no dose-response relationship for asthma symptom control and spirometry was observed (28). However, in patients treated with 100 and 200 mg [calculated maximum plasma concentration >3 and 7 μmol/l, respectively (29)], the morning and evening peak expiratory flow rates showed nearly twice the improvement compared to patients receiving lower doses, suggesting that higher doses of this drug could have an additional impact on asthma treatment. The inhibition of UDP signaling by LTRAs required higher micromolar concentrations (10–100 μmol/l) in our study. The maximum plasma concentration exceeded 25 μmol/l after the oral administration of 800 mg of montelukast, a dose that was still well tolerated (29); however, the clinical relevance of such doses has not been tested. It was shown that LTRAs may also affect other non–CysLT1-mediated pathways in human primary cells. Montelukast inhibited eosinophil protease activity (9), and pranlukast suppressed LPS-induced IL-6 production in PBMCs (30); both effects were observed at micromolar drug concentrations. All of these data strongly suggest that in addition to CysLT1 antagonism, other proinflammatory pathways may be affected by LTRA treatment and, depending on plasma drug concentration, variable responses to treatment may be expected. It was suggested that CysLT1 expressed on human mast cells is also a pyrimidinergic receptor and that it responds to UDP stimulation in addition to cysLTs (14, 31). In our study, human monocytes responded to LTD4 and UDP, but with characteristics suggesting that UDP acts through separate receptors. First, 3-log greater concentrations (10−4 mol/l) of UDP were required to submaximally activate calcium flux in monocytes than reported in the study by Mellor et al. (14). Although UDP signaling in monocytes was inhibited by LTRAs, much greater concentrations of LTRAs were needed. Almost every GPCR studied undergoes desensitization following agonist stimulation, an important process that is crucial for turning off the receptor-mediated signaling pathway. As expected, CysLT1 underwent LTD4-induced homologous desensitization in monocytes, but we did not observe desensitization of UDP-induced calcium flux subsequent to LTD4 treatment, a phenomenon that should be present when both agonists act on the same GPCR. A similar observation was reported in differentiated U937 cells (32); CysLT1 desensitization and trafficking were differentially regulated by LTD4 and extracellular nucleotides, including UDP. Capra et al. (32) showed that CysLT1 may be a target for extracellular nucleotide-induced heterologous desensitization, a potential feedback mechanism in inflammation. The presence of this heterologous desensitization mechanism was demonstrated for the first time in human primary cells in our study. UDP signals effectively through calcium flux acting on P2Y6 in human cells (33). Because human monocytes express mRNA for CysLT1 and P2Y6, we downregulated CysLT1 expression by IL-10 preincubation or specific CysLT1 siRNA to further support the observation that UDP does not signal through CysLT1 in monocytes; we noted a specific decrease in LTD4-induced signaling, without an effect on UDP-induced calcium mobilization. Knockdown of P2Y6 decreased UDP-induced calcium flux but did not affect LTD4-induced signaling. All of these data suggest that UDP is not a CysLT1 agonist in human cells, but it may signal through a different GPCR. In fact, a newly described cysLT receptor (GPR17) was shown to be a dual UDP/cysLT receptor (34). We showed previously that GPR17 is not expressed in human monocytes (13), excluding this receptor as a potential target for UDP in monocytes. Interestingly, the presence of GPR17 was detected in mast cell line LAD2, an observation that might explain cysLT receptor-related signaling induced by UDP in mast cells (35). It was also suggested that additional, not-yet-characterized cysLT receptors might be expressed in mast cells (35). The described inhibitory activity of LTRAs on the 5-LO pathway and extracellular nucleotide-induced signaling may be relevant for designing new asthma treatment strategies. LTB4, another product of the 5-LO pathway, was reported to contribute to the recruitment and activation of neutrophils and eosinophils and play an important role in asthma exacerbations (36). Extracellular nucleotides serve as a danger signal to alert the immune system of tissue damage. It was shown in a murine model that extracellular ATP triggers and maintains asthmatic airway inflammation by activating dendritic cells (37). UDP may mediate microglial phagocytosis (38) and play a role in innate immune responses, but its significance for asthmatic inflammation is not known. Higher doses of currently known LTRAs or new compounds derived from this class of drugs may represent a new strategy for finding more efficient therapy for bronchial asthma.
. 1994. Effects of 6 weeks of therapy with oral doses of ICI 204,219, a leukotriene D4 receptor antagonist, in subjects with bronchial asthma. Am. J. Respir. Crit. Care Med. 150: 618–623.
. 1998. Montelukast, a once-daily leukotriene receptor antagonist, in the treatment of chronic asthma: a multicenter, randomized, double-blind trial. Arch. Intern. Med. 158: 1213–1220.
. 1999. Oral montelukast, inhaled beclomethasone, and placebo for chronic asthma. A randomized, controlled trial. Ann. Intern. Med. 130: 487–495.
. 2005. Characterization of within-subject responses to fluticasone and montelukast in childhood asthma. J. Allergy Clin. Immunol. 115: 233–242.
. 1997. Naturally occurring mutations in the human 5-lipoxygenase gene promoter that modify transcription factor binding and reporter gene transcription. J. Clin. Invest. 99: 1130–1137.
. 2006. Influence of leukotriene pathway polymorphisms on response to montelukast in asthma. Am. J. Respir. Crit. Care Med. 173: 379–385.
. 2007. Leukotrienes. N. Engl. J. Med. 357: 1841–1854.
. 2007. Cysteinyl-leukotrienes and their receptors in asthma and other inflammatory diseases: critical update and emerging trends. Med. Res. Rev. 27: 469–527.
. 2006. Montelukast regulates eosinophil protease activity through a leukotriene-independent mechanism. J. Allergy Clin. Immunol. 118: 113–119.
. 2008. Montelukast inhibits tumour necrosis factor-alpha-mediated interleukin-8 expression through inhibition of nuclear factor-kappaB p65-associated histone acetyltransferase activity. Clin. Exp. Allergy 38: 805–811.
. 2004. Novel inhibitory effect on 5-lipoxygenase activity by the anti-asthma drug montelukast. Biochem. Biophys. Res. Commun. 324: 815–821.
. 2008. ATP-dependent transport of leukotrienes B4 and C4 by the multidrug resistance protein ABCC4 (MRP4). J. Pharmacol. Exp. Ther. 324: 86–94.
. 2008. Leukotriene D(4) induces gene expression in human monocytes through cysteinyl leukotriene type I receptor. J. Allergy Clin. Immunol. 121: 215–221.e1.
. 2001. Cysteinyl leukotriene receptor 1 is also a pyrimidinergic receptor and is expressed by human mast cells. Proc. Natl. Acad. Sci. USA 98: 7964–7969.
. 2008. IL-10 inhibits cysteinyl leukotriene-induced activation of human monocytes and monocyte-derived dendritic cells. J. Immunol. 180: 7597–7603.
. 2009. P2Y6 receptors require an intact cysteinyl leukotriene synthetic and signaling system to induce survival and activation of mast cells. J. Immunol. 182: 1129–1137.
. 1999. Characterization of the human cysteinyl leukotriene CysLT1 receptor. Nature 399: 789–793.
. 1999. Identification, molecular cloning, expression, and characterization of a cysteinyl leukotriene receptor. Mol. Pharmacol. 56: 657–663.
. 2005. CysLT1 leukotriene receptor antagonists inhibit the effects of nucleotides acting at P2Y receptors. Biochem. Pharmacol. 71: 115–125. 1998. Chemistry and structure-activity relationships of leukotriene receptor antagonists. Am. J. Respir. Crit. Care Med. 157: S220–S226.
. 2000. Montelukast: a review of its therapeutic potential in persistent asthma. Drugs 59: 891–928.
. 2001. Zafirlukast: an update of its pharmacology and therapeutic efficacy in asthma. Drugs 61: 285–315. 2007. Treatment heterogeneity in asthma: genetics of response to leukotriene modifiers. Mol. Diagn. Ther. 11: 97–104.
. 2009. Absorption of montelukast is transporter mediated: a common variant of OATP2B1 is associated with reduced plasma concentrations and poor response. Pharmacogenet. Genomics 19: 129–138.
. 1996. Pharmacokinetics, bioavailability, and safety of montelukast sodium (MK-0476) in healthy males and females. Pharm. Res. 13: 445–448.
. 1999. Montelukast dose selection in 6- to 14-year-olds: comparison of single-dose pharmacokinetics in children and adults. J. Clin. Pharmacol. 39: 786–793.
. 1998. A placebo-controlled, dose-ranging study of montelukast, a cysteinyl leukotriene-receptor antagonist. J. Allergy Clin. Immunol. 102: 50–56.
. 1995. Single dose pharmacokinetics, safety and tolerability of MK-0476, a new leukotriene D4-receptor antagonist, in healthy volunteers. Br. J. Clin. Pharmacol. 40: 277–280.
. 2003. Pranlukast inhibits NF-kappa B activation in human monocytes/macrophages and T cells. Clin. Exp. Allergy 33: 802–807.
. 2002. Cysteinyl leukotrienes and uridine diphosphate induce cytokine generation by human mast cells through an interleukin 4-regulated pathway that is inhibited by leukotriene receptor antagonists. J. Exp. Med. 195: 583–592.
. 2005. CysLT1 receptor is a target for extracellular nucleotide-induced heterologous desensitization: a possible feedback mechanism in inflammation. J. Cell Sci. 118: 5625–5636.
. 2006. The orphan receptor GPR17 identified as a new dual uracil nucleotides/cysteinyl-leukotrienes receptor. EMBO J. 25: 4615–4627.
. 2008. Leukotriene E4 activates peroxisome proliferator-activated receptor gamma and induces prostaglandin D2 generation by human mast cells. J. Biol. Chem. 283: 16477–16487.
. 2007. Extracellular ATP triggers and maintains asthmatic airway inflammation by activating dendritic cells. Nat. Med. 13: 913–919.